Nothing will stop the tide of content, not even performance issues and the abandonment of SLI support. Provided that Warner Bros' many rounds of fixes have knocked your copy of Batman: Arkham Knight into playable shape, its December DLC, Season of Infamy: Most Wanted, might appeal. It's available to buy now, and included in the Arkham Knight season pass. Season of Infamy introduces four new storylines featuring iconic Batman villains: Ra’s Al Ghul, Mr. Freeze, Killer Croc, and the Mad Hatter. The latter mission features heavily in the trailer and is by far the most interesting to me: the hallucinatory Scarecrow segments of Arkham Asylum were among its most memorable, and it's clear Rocksteady is hoping to recapture the same trippy horror. Mr. Freeze is a compelling returning character, being about the only Batman villain to sometimes behave like a human. 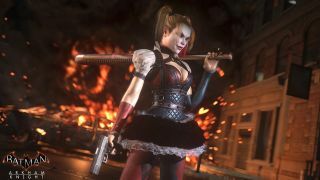 I can only hope these missions are more substantial than the lacklustre Harley Quinn pre-order bonus. Joining this identity parade are a handful of new skins for Bats and his ride and the fifth Crime Fighter Challenge Pack, which focuses on Freeflow Combat and Invisible Predator training. Happy crime-fighting.